These are serious times. Very few will escape the impact of the financial and economic problems that have originated in the United States but whose reach has been global to the degree to which international banks and institutions have pursued the apparently “easy" money to be made from dubious, American-grown and widely peddled, instruments. The fall-out has been huge and encompassing. As I have suggested recently, and at length, elsewhere, (S Woolman 'The Amazing, Vanishing Bill of Rights' (2007) 124 SALJ 762), the Constitutional Court's penchant for outcome- based decision-making, and a concomitant lack of analytical rigour, has finally caught up with it. Pro bono. As a friend of mine once said, “We're not talking about the U2 fan club here." Lawyers who provide free legal assistance for the public benefit are said to engage in pro bono work. Regardless of whether a mandatory pro bono system applies, many attorneys are passionate about assisting poor people living on the margins of an unequal society. The prospect of not recovering costs is not a disincentive to litigating on a pro bono basis. “My budget has absolutely nothing to do with my sentiments," says one attorney. A cornerstone of the Constitution is that no-one can be denied the right to judicial redress. The draft Expropriation Amendment Bill, which still isn't in the public domain but which has been informed by a policy document on land redistribution released last November, has upped the stakes in an escalating standoff between government and organised agriculture. Cabinet has approved the Bill, which is set to be tabled before parliament by Public Works Minister Thoko Didiza in April. The judgement in Verimark (Pty) Ltd v BMW AG set out certain requirements for the use of a third party's trade mark in advertising. It does not, however, necessarily change the existing position with regards to comparative advertising, and practitioners should tread lightly when planning comparative advertising. This is part two of a two-part series. The first part appeared in the February 2008 issue (p17) APPROVAL OF EXTERNAL CREDIT ASSESSMENT INSTITUTIONS AND MAPPING OF EXTERNAL RATINGS Basel II is a risk-sensitive framework which uses external credit assessments issued by eligible institutions for purposes of calculating a bank's prescribed minimum amount of required capital and reserve funds. The existence of a holding/subsidiary relationship between companies is of vital importance, not only because it gives rise to a number of economic and administrative advantages but it also gives enables the application of various provisions of the Companies Act, 1973, which are aimed at preventing abuse which could arise out of such an arrangement.1 For example, in terms of s37 of the Act, the details of a loan given by a subsidiary company to its holding company must be disclosed in the financial statements of the subsidiary company so as to protect its minority shareholders. On December 14 2007 the Corporate Laws Amendment Act (24 of 2006) came into operation with amendments to various provisions of the Companies Act (61 of 1973). DUISTER V ESKOM Foss-Harbottle J: We have moved within months from an age of black economic empowerment to blacked-out economic disempowerment. The purchaser of immovable property is frequently required to produce a bank guarantee "acceptable to the seller." In Koumantarakis Group CC v Mystic River Investment 45 (Pty) Ltd and Another the question arose whether the seller acted unreasonably in rejecting a revocable bank guarantee. THE rough justice in parts of the platteland causes kinder, gentler city folk to feel faint and rush for a copy of the Constitution. I say that upfront as something of a disclaimer or parental guidance warning for what follows. This is, after all, an erudite publication for people who move in elite circles and seldom come across the real riff-raff of society. So the publisher has insisted that readers are properly warned and given the chance to opt out, rather than read on: after all, he has subscribers and advertisers to protect. There's nothing quite like coming home after a hard day's work to soak in a hot bath and then sitting down (or, more than likely, slumping) in front of the 'box' with an alcoholic beverage of choice in hand. In fact, we're told that a glass of wine – must be red, of course – a day is actually good for us. But, for stressed-out lawyers, one glass is often followed by a second and third, maybe even more. 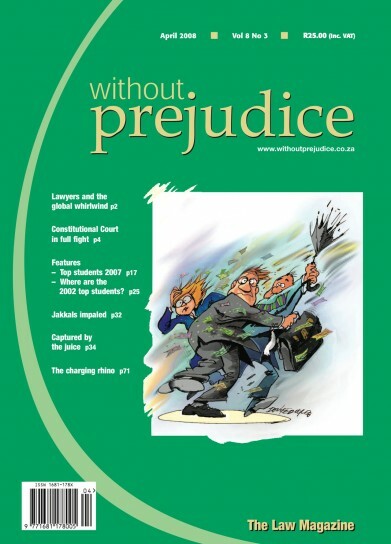 Two recent Supreme Court of Appeal judgements deal with the question of substance over form in evaluating tenders; and a judgement of the Durban and Coast Local Division creates a new term – “administrative non-responsiveness" – to describe a bidder's failure to comply with tender requirements relating to the form of the tender. It is somewhat interesting (and, on the whole, rather wellreceived) that, smack in the middle of a global economy clouded by volatility, rising inflation, supply constraints and the yoke of sub-prime, South Africa's 2008/2009 budget unveiled a progressive, robust and overall resilient approach. To many, the recent budget is seen as heralding a victory in the protracted path towards sustainable development, foreign investment reform, financial stability and international competitiveness.